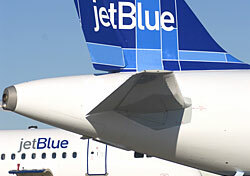 JetBlue marks its eighth anniversary this year, and is giving away 800 free flights to celebrate. One hundred TrueBlue frequent flyers will earn eight free flights; one to use and the other seven to give away to other travelers. To enter JetBlue’s sweepstakes, sign into your TrueBlue account and click on “Enter for a chance to win.” If you’re not yet a member of JetBlue’s frequent flyer program, you can easily sign up and enter. The contest ends on February 29, and is open to legal U.S. residents age 18 and over.